At very different resolutions the text sometimes seems to "twitch" when you go to a different animation / fragment within a slide. Please look at the slides in Chrome, preferably at a resolution of 1920x1080. Although everything should work in Firefox and Safari as well, it just looks best in Chrome. Many people asked me what I used to create my slides, so below you can find my resources, some learnings and a few screenshots of things that never made the cut. I knew that I wanted to show data visualizations. And although making videos for use in KeyNote or PowerPoint is fine in most cases, I also wanted to be able to interact with some of the visualizations. Furthermore, I really wanted the highest possible resolution, which you can only get with the real thing. So any static slide making program was out of the question. RevealJS also has a very long list of example presentations to get inspiration from. Both visual and code. In RevealJS you can hide the navigation buttons, which I did. Something that might become clear after going through my slides is that I have a thing for hexagons. It all started when I was heavily using/writing an R program to make Self-Organizing Maps. And for this presentation, I decided very early one to use hexagons as my main shape. One of the most fun things to do was to figure out how to make a bunch of circles bounce around inside a hexagon. I remembered a bl.ock by Maarten Lambrecht in which circles move inside in a rectangle. I started with that example and then kept on making changes. The hexagon move function now looks rather different than the rectangle move version of Maarten, but in an abstract sense, it’s still the same idea: slowly transition the circles to a randomly chosen new edge of the hexagon. As with data visualizations, I started to design my slides on plain paper. Some of them didn’t make it, or were changed a bit, but many of the sketches were turned into actual slides. I had a small notebook that I’d take out during my morning and evening commutes where I found it most easy to not be distracted. I didn’t draw out all the slides before moving onto code. I first drew a few sections to see if this was the way that I wanted to go. Then I started coding up a section at home and drawing a new section while on the train. In my first full iteration of the presentation, I had a lot more code. I wanted to explain each of the 9 examples in detail as I would normally do in a tutorial. However, talking through all the slides on my first try took 40-50 minutes… So I needed to trim a bit. I showed the slides to my manager and asked him what to take out. His advice was to take out the code and leave as many examples as possible. 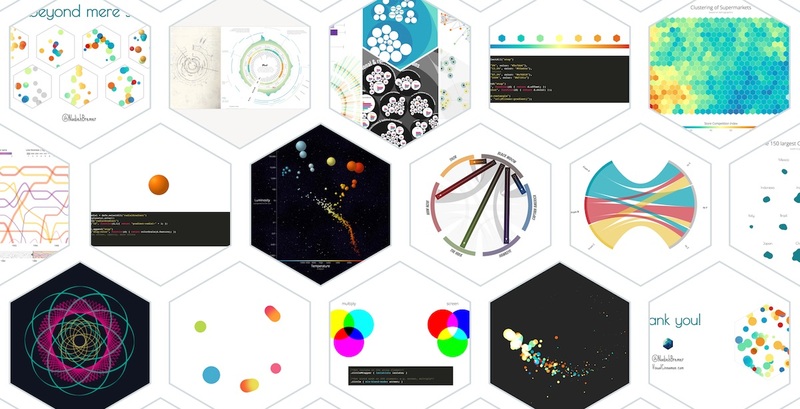 And I fully agreed, my goal was to showcase the possibilities of experimenting with non-standard dataviz things. You can’t really remember the code anyway afterwards, but hopefully, the examples stick. And I’m writing a tutorial for each of the examples anyway. Below you can see the (functioning) first iteration of my title-slide. Luckily, we have a design team where I work, so I showed it to the Creative Director and he gave some tips for improvement which turned into the eventual slide where the title is no longer hiding the hexagons. And for the attendees who know what the image below means. I was lucky enough to get a hold of the amazing Jim Vallandingham’s Racial Divide image made by the pen plotter who worked tirelessly throughout the conference. And that was it for this bonus blog in the “SVGs beyond mere shapes” series!